Again, I’m sorry my April Fool’s joke in which I used TV quotes in an attempt to fool you back fired into finding out that my real life sounds remarkably similar to a sitcom. Last Sunday, Dawne got a migraine and when she eventually was able to leave her bed she realized that the rest of us were enjoying her sick day by playing video games, watching TV and basically using as little energy as possible—something we really don’t ever get to do unless Dawne is bed ridden. I promise I did not feed her something that gives her migraines…. On purpose. Dawne: I have really amazing incredible news. Dawne: You are just going to be so excited. Luke: Just tell me. You’re building it up too much. Me: Your mom is adopting a baby sister for you! Dawne: Ha ha. Actually your school kicked you out. I thought you’d be excited because you wanted to go back to Mercer. Dawne: Just kidding. You got into the driver’s ed class. Luke: Not. Cool. Not cool. Dawne: What’s the matter with you? Luke: My heart is still palpitating. You can’t do that to me. Seriously. My heart. It doesn’t not feel good. I can’t believe you did that to me. Me: So weird. It’s not like that time that your parents took the whole family out for lunch (after coming back from Arizona) for a family meeting and told us first that she was pregnant and then said haha we’re moving to Arizona—seriously we just bought a house. That was truly horrifying. Luke (still clutching his heart): Oh ya. At that Pizza Place. I didn’t like that either. Dawne: Look at my finger. It’s turned blue. I think I have diabetes. Me: Maybe you’re just allergic to the new medication. Did you look at the side effects? Dawne: Of course. It has a whole list of side effects (starts reading them off) …and paranoia. But I still think its diabetes. Me: Right. Not paranoia. Not the medication. Definitely Diabetes. Becky was telling me a story about trials and tribulations of communication with her boss today at lunch. Zach: We got a tornado warning the other day that told us we needed to head inside to safe place. I looked up and sadly realized that I was in a computer lab with no windows and I could safely keep working for another 8 hours if I wanted to. Perfect. Lucas: No really. We do. Me: I know. If I didn’t I wouldn’t be here because I can leave. Where is this coming from? Lucas: Well a lot of high schoolers are always complaining about their family and I feel bad for them b/c our family is so awesome. And then we watched Daria. 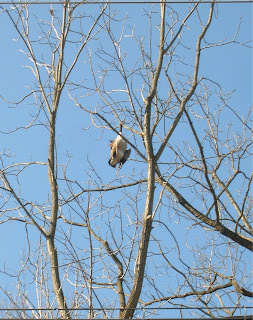 Today when Dad and I were driving home from the gym and turning the corner and noticed something hanging in the tree. I wasn't 100% sure of what I saw and so we turned around and came back to look again. YEP - exactly what I thought the first time. 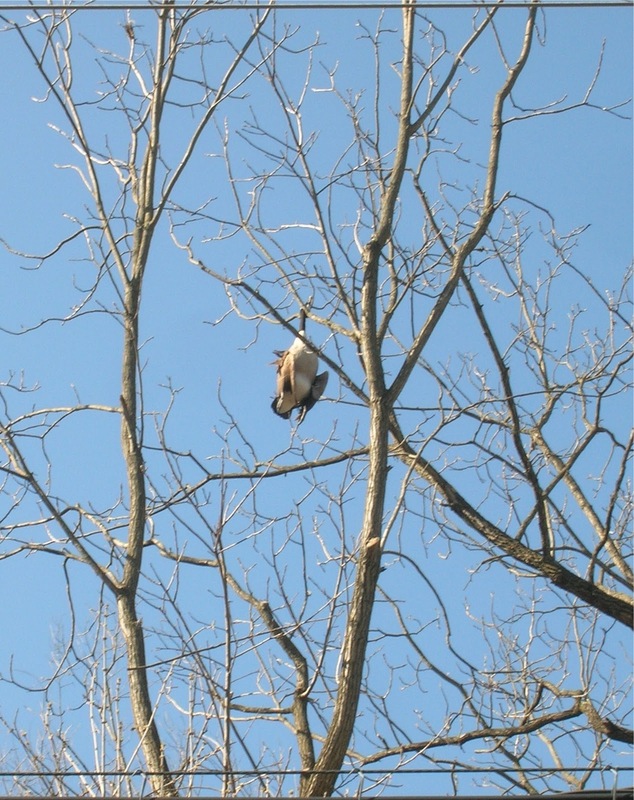 A goose had "hung" himself in a tree - about 50 feet up in the air. We figured he was either taking off or landing, maybe scared, or it was dark. Hit the trees and got his neck caught in between the branches. Jordan bought more Bucky Balls which I immediately combined with the other set of Bucky balls, only to realize that they were ever so slightly different sizes and had to separate each individual magnet from each other which only took like 2 episodes of Daria. I then came into work, stopped by café ladro and promptly told the chick that I broke my coffee card. Bucky Balls. The chick was confused, but the guy waiting in line behind me was like… Ya. Bucky Balls. That’ll do it. I recently met this recruiter who has been sending jobs over to me. When she first called she commented about how my voicemail is very professional sounding. I said, “yes. It is the first time but I hear the more you listen to it the more sarcastic it sounds.” Now, every time she leaves a message she is laughing as if I am actually getting funnier with every call. She told me even if I don’t get such and such a job we still need to get together and hang out over some champagne. She asked me about my weekend and I told her that I had spent 7 hours making a cake for my cousin. Me: No. My cousin. I’m still looking for a husband—do you recruit for those also? Rita: For you? I could do that. Me: If you have to make a choice between job or husband, finding me a husband is more important. Rita: Well, I think you would love my son. He’s very handsome. Italian—do you like Italians? He’s in the air force. He’s a little young for you, but I think it would be okay. Now, my boys always share everything with me so I know that when he was younger, he was a bit of a player. I’m only telling you this b/c this is not how I raised him. He has started to grow out of it though and he’s ready to settle down. I’ll set that up. Oh and let you know about that job thing. I feel like I should put together a romantic resume… maybe I can steal some ideas from this chick? I went to pick up a puppy with Shana on Saturday. Her name is Coco Channel and she is adorable. Here are two videos of Nala and Coco. Please keep in mind that Nala is only three pounds when you see this munchkin running next to her. She was the first dog that Nala was not submissive to and was actually more like “Hey! Keep up. We got a lot of grass to cover here.” I just wish we had gotten a shot of Coco easily being able to walk under Nala. Sorry I couldn’t stop talking… but hey no one should be surprised by this. And lastly… in case anyone forgot or isn’t on facebook… my birthday is this Thursday—and more than usual, I am going to need to be showered with lots of love so… get on that. Kthnxbye.